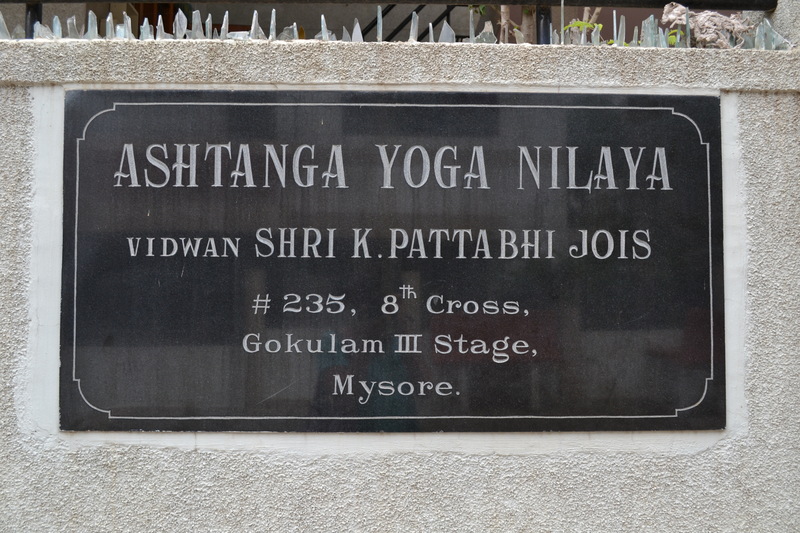 3 weeks back home and… already missing my practice at K. Pattabhi Jois Ashtanga Yoga Institute so much! 1/ the deep reverence for the practise: a symbol of it to me is the little foyer where you sit and wait before being allowed to enter the shala and practice. You’re running, you’re absorbed in your thinking but, once you get there, you just sit in silence, you let your life outside the door, you start looking inwards and once you get on the mat a bulk of the job has already been done! Yeah, it can be annoying in the beginning as in the West we are so used to get all that we want whenever we want and in that little foyer that’s not the case. 2/ the vibrant energy of the Shala: stepping inside, the only ‘noise’ to be heard is the deep breath. Nobody is talking, concentration seems to be at the highest, dharana… and that results in a very strong energy imbibing the place, making you feel like giving your best in your spiritual quest, making you feel proud of being part of that magic. 3/ the warm wheather: practise at 6am can already see you sweating all over. You’re than lucky (or so :D) if your practice is at 4.15am when it is still a bit cool. Moreover, the Shala is very humid as well, so your flexibility is just at the top… though it doesn’t equal to say that your practise is easier. 4/ the mutual support: for some reason still unknown to me, once you are in the Shala, the support of the other practitioners is almost solid, highly perceptible… and they can be amazing teachers to you while not even knowing it. This entry was posted in Ashtanga Yoga and tagged ashtanga, Ashtanga yoga, Ashtanga yoga nilaya, Gokulam, India, K. Pattabhi Jois Ashtanga Yoga Institute, KPJAYI, Mysore, Pattabhi Jois Ashtanga Yoga Institute, Sharath, Sharath Jois, yoga. Bookmark the permalink.